Sydney Rock Oyster, Pacific Oyster, Native Oyster are the most commonly known in Australia. The NATIVE OYSTER (often called ‘Angassi’) is a ‘flat oyster’ related to the European Belon oyster. They are grown in limited commercial quantities in the southern states of Australia. Native Oysters have seen a resurgence in popularity in recent years with high end restaurants championing them. They are available May to August. They spawn from November to March, when they are gritty and inedible. 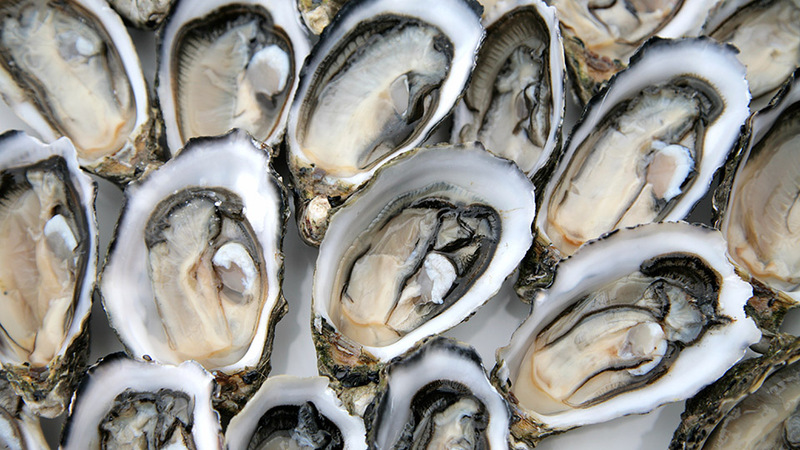 Native oysters have fine textured meat and a distinctively salty flavour. PACIFIC OYSTERS were introduced from Japan in the 1940’s. They are grown in the deep cool waters of SA and TAS. They have recently become dominant at market over the Sydney Rock Oyster, favoured by growers because they take less time (18-24 months) to reach saleable size and have a more uniform shell size and shape. They are considered an invasive species in many states and are banned in QLD, VIC, WA and most of NSW. They are available year round but peak from April to September and are best avoided in Jan and Feb when they spawn. They are sweet and creamy with a strong briny taste and smell. ‘TRIPLOID’ oysters are a sexless oyster. Becasue they are sterile they can be grown in areas with native oyster populations (such as the Hawkesbury, Georges and Shoalhaven estuaries in NSW). As they don’t spawn they are favoured by growers and chefs. ‘KUMAMOTO-STYLE OYSTERS’ are not a true Kumamoto (an oyster originating in Japan) but a Pacific Oyster grown in conditions that develop the small but deep rounded shell, large firm muscle and sweet flesh characteristic of the species. Oysters are being grown in this style in Coffin Bay, SA. Farming methods for Oysters have very little impact on surrounding ecosystems.